Zentai Living is the major Supplier of traditional Tatami Matting in Australia. We supply many Japanese restaurants, interior designers, and customers wishing to add the beauty and natural comfort of Tatami to their home. The Tatami mat dates back to 71AD, when Emperor Shoumu first used it as a bed. But there were rules governing the use of Tatami. People of different social ranks had different types of mat thickness and varying colours of fabric edging. The edge of the mat for the Emperor was usually from the best available silk. Later in the EDO area (about 1730 AD) Tatami came commonplace. 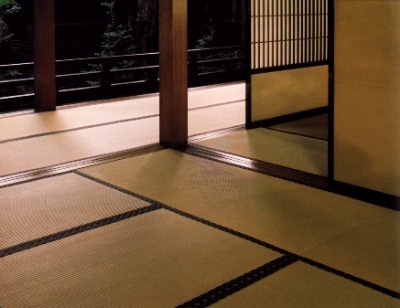 Today Tatami are not only used as beds but also as flooring. Tatami is made from rush called igusa. The mat is finely woven from this rush and rice straw. About 4-5,000 pieces of rush are used to make one full-size Tatami. Tatami have been reported to help clean the air in the room because the Tatami absorbs nitrogen dioxide. It is also hydroscopic (moisture absorbant) when there is high humidity, and it discharges this when the air is dry. It is also a good insulator, as it helps to keep you cool in summer and warm in winter. A standing person takes up half a mat, a sleeping person a full mat. As this suggests, a single tatami mat accommodates two standing people; thus if two mats are placed together, there is just enough room to seat four to six people around a small table. Since this is perfect for playing cards or for doing flower arrangements, an initial purchase of two mats is recommended. More mats can be added later, following the patterns shown in the photos above. When it comes to laying several tatami down together, one has to take into account the way in which they reflect light.. Since the rushes used for the cover are not very long, they are wound laterally across the width of the mat in close parallel lines. The reflection of light varies according to the placement of the mats. Thus, some tatami will appear light, and others, dark, in the same room. The interesting patterns created add to the attractiveness of tatami. Tatami are surprisingly durable and easy to clean, requiring only a damp cloth or vacuum cleaner with a special brush attachment. Stubborn marks may be cleaned with an equal amount of white vinegar and hand-warm water, using a damp cloth. Do not use strong detergents or abrasive cleaners as these may damage the surface finish of your mats. Allow your mats to air by removing the futon (or other coverings) on a regular basis, at least twice a year. If mats are used as flooring shoes should not be worn! NOTE: over time the colour of the straw on the surface will fade from a sage green to a lighter tone; this varies according to how much exposure to light the mat receives.